Free Corporation or LLC Name Check in any state! What's in a name? Everything when it comes to your business. 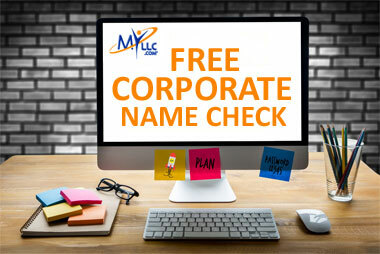 Conducting a free corporate name check is the first step to ensuring the name of the corporation or Limited Liability Company (LLC) you want to use is available. MyLLC.com offers our clients a free corporate name check in order to ensure that no one in your state is using the name you want to use for your company. The best part is it's simple to use! Contact our experts at MyLLC.com to assist you in your search. Once you determine that the name you want is available, you can start the LLC or Corporation formation process. Time is of the essence. Thousands of new business entities are filing for corporations daily, so once you verify that your chosen name is available, contact one of our experts today! MyLLC.com will assist you to get started with the first step of building your brand by securing your name!